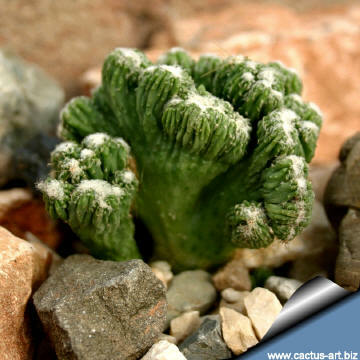 it is very nice and forms many sculptural monstrous and crested shapes. Origin: This plant is said to be a wild monstrosity from Mexico. 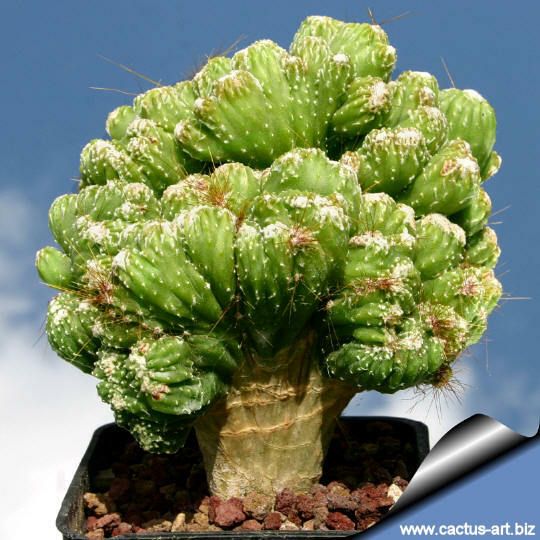 Description: Produces lots of sculptural green monstrous and crested shapes with white wool on the top and any or a few very short bristly reddish spines. It looks more like a green coral tree than a cactus and shows different crested and monstrose shapes. 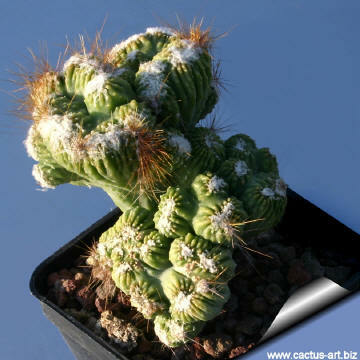 There are several other crested Cereus clones that have a tendency to fan out, but the "Wild Crest" is surely one of the best form available. Due to its compact and reduced size It make a spectacular attraction also in small pots in the greenhouse and in the house too. 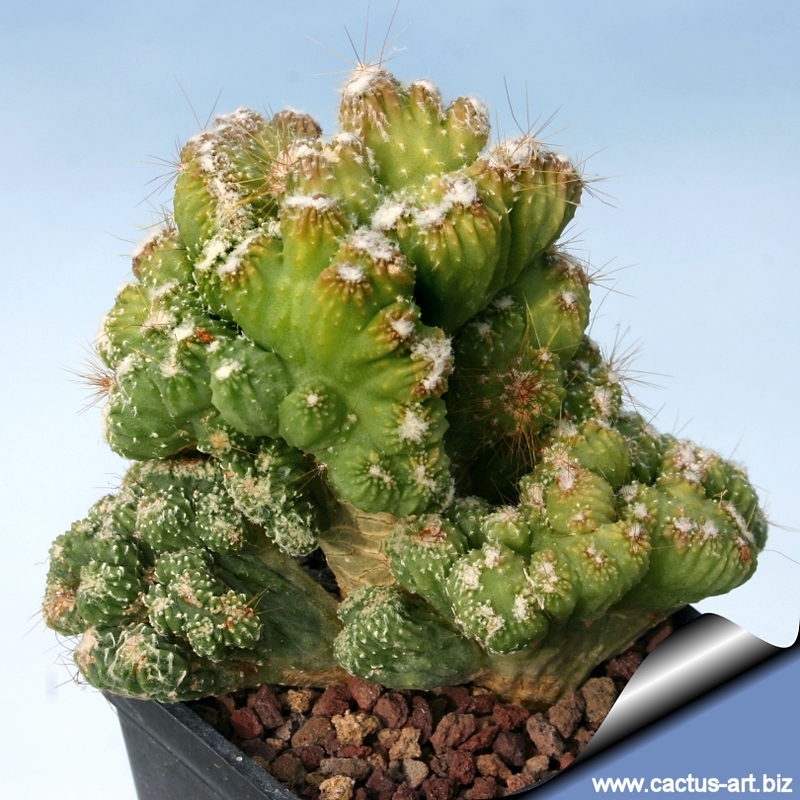 Cultivation: Cereus sp. 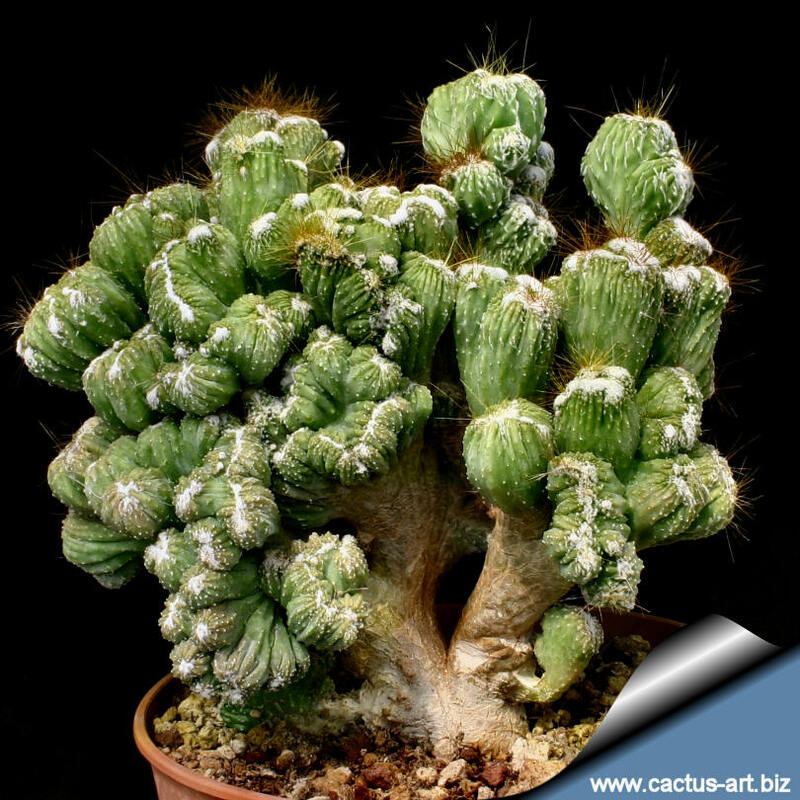 "Wild crest" grows well on its own roots and will form quite large clumps of several offsets, if given time and grown properly. They are semi hardy, make sure that your Cereus are not exposed to temperatures below -4°C or they may die, nevertheless it is a good advice never let the nighttimes temperatures fall below 10°C. Protect from frosts and freezes. Water thoroughly during the growing season when soil is dry to the touch. Need a well-drained soil mix with small gravel added to ensure drainage. 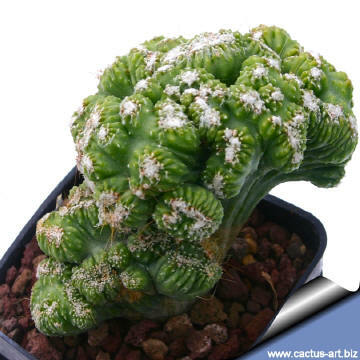 Less or no water during cold winter months to prevent root loss. Since they are big sized plants need plenty of space for their roots, repotting should be done every other year or when the plant has outgrown its pot. 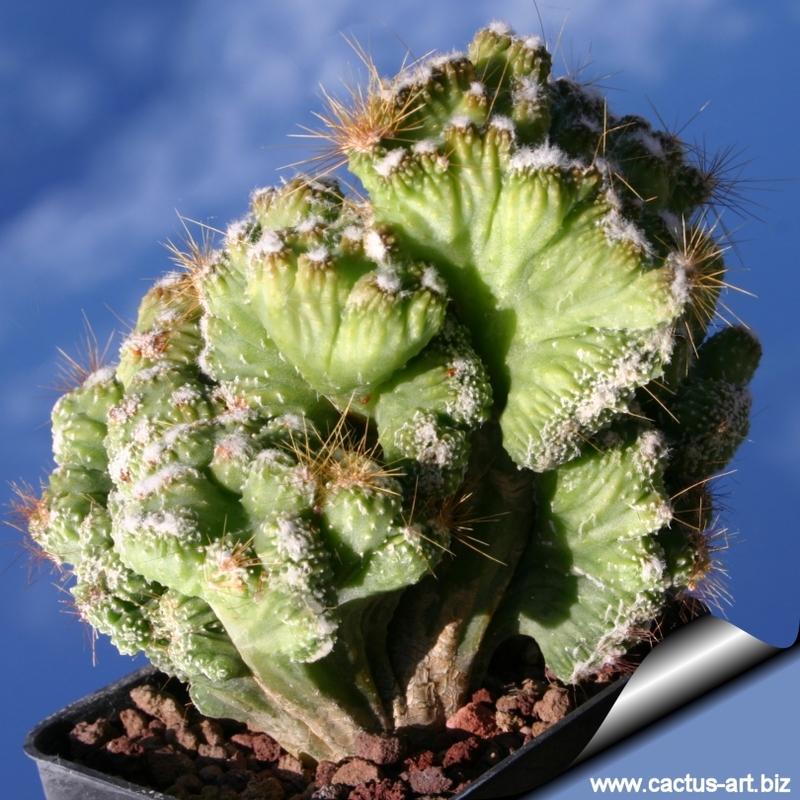 It needs bright light, and some direct sun, but avoid direct afternoon sun in summer. 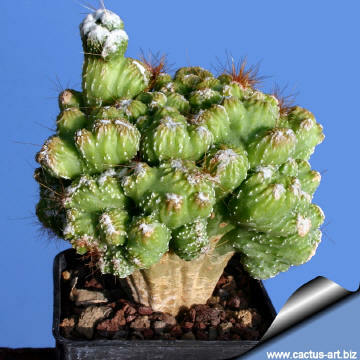 Newly potted plants should not be fertilized for a year; established plants should be fertilized once each spring with a high potassium fertilizer. Keep well ventilated as it is prone to root rot.